BrahMos missile on 23rd November successfully test fired for the first time, from the Indian Air Force's frontline Sukhoi-30 MKI combat jet. BrahMos missile provides Indian Air Force a much desired capability to strike from large stand-off ranges on any target be in sea or land with pinpoint accuracy by day or night and in all weather conditions. IAF is the first Air Force in the world to have successfully fired an air launched 2.8 Mach surface attack missile of this category. Prime Minister Narendra Modi expressed delight over the successful maiden test flight of BrahMos cruise missile from an Air Force jet. In a tweet he Congratulated all those associated with this remarkable feat. Brahmos Air Launched Cruise Missile (ALCM) weighs 2.5 ton and it is the heaviest weapon to be deployed on India’s Su-30 fighter aircraft. The world-class weapon with multi-platform, multi-mission role is now capable of being launched from land, sea and air, completing the tactical cruise missile triad for India. 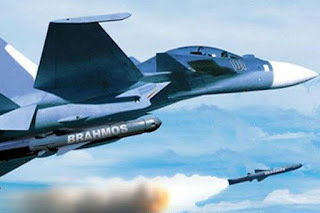 BrahMos is a joint venture between DRDO of India and NPOM of Russia.